Have you ever not been able to do something you love? Was it because of an injury? You didn’t have enough time in the day? Or maybe someone convinced you to do something else? I’m sure we’ve all fallen under one of these categories. 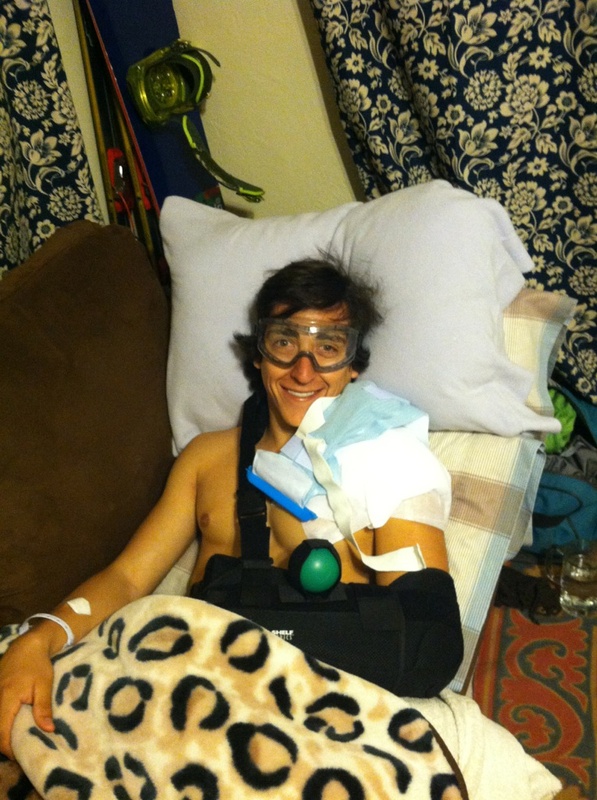 The day before yesterday I had surgery because my left labrum was torn from dislocating my shoulder several times. My recovery time is 3-5 months, and in this time I won’t be able to do many of the outdoor activities that I love. I haven’t gone stir crazy yet but I’m not exactly the personality that is able to sit on the couch and hang out for long periods of time. I find a release, motivation and energy from the joy I get by running, biking, working out and other activities. Before I went in for surgery I went skiing and snowboarding three days in a row. It was perfect spring conditions. We went to Squaw Valley, Sugarbowl, and Mt. Rose. I got to ski with friends and family each day. I enjoyed doing something I love with awesome people, to me it can’t get much better than that. Each day I stopped at the top of the mountain and took time to reflect. I thanked God for the beautiful creation before me. I was thankful for the time I was given to do the things I love. Also, as much as I hate to admit it, I’m thankful I had surgery and that it went well, even though I’ll be out for some time. My girlfriend does a good job of reminding me to think about the long term. As hard as I want to go and do stuff now, if I don’t stop to take care of my body now then it won’t last long term. I do want to ski until I’m 80, bike the rest of my life, and be able to rock climb again. In order to do those things I must take time to rest my body and take good care of it. This is the same way I’ve learned to think about the environment I love. If we aren’t caring for it now how is it going to last long term? We need to take the time to make sure that our environment is healthy so that it stays beautiful in the long term. This is why I asked if you are unable to do the things you love. Are you making excuses? I know when I truly am not grateful for my ability to do the things I love is usually when I don’t end up doing them. You have to be true to yourself and what you believe in. Don’t make excuses because there are those out there who physically can’t do the things they love who would love to be in your shoes. What’s preventing you from doing the things you love? Now get out there and do those things! I had a bulging disk in my back and wasn’t able to run for over three months. I was a bear to be around. When I went in for PT, my therapist would ask hesitantly if I had been doing my exercises and I told him that I did everything exactly as he prescribed because I knew it would get me better quicker. Yes, thanks for sharing! It’s definitely motivating and easier to be patient when friends and family remind me of the end goal, not just what I want to do in the moment. How did you hurt your back Nicole? I hurt it by training too hard for a marathon last fall. I ran 23 miles in the Ragnar Relay and pushed myself to keep running up to my marathon. I thought I had sprained my foot before the race, but it was later confirmed that it was a bulging disk. I spent over three months not able to run and I was miserable. I obeyed every one of my doctor’s orders and I’m running again (while still seeing him for maintenance and strength training). Hoping you have a speedy recovery. I feel for you. I have torn my knee ligaments a number of times, requiring reconstructive surgery. Now I have serious arthritus in both joints, as well as my spine (possibly from compensating and limping from the knee pain). So I only have a few years left of good hard skiing… Only problem is, I HAVE NO MONEY TO SKI!!! ARGHHH!!! lol. Heal up man. No point in getting back before you’re ready and causing further injury. Just look forward to the day when you are 100% and you can do some serious shredding! Take care. Thanks Anthony! I will definitely wait until I’m 100% before I get back out there full force. Right now is a good time to look at all the awesome experiences I have had and it creates a desire for more in the future!